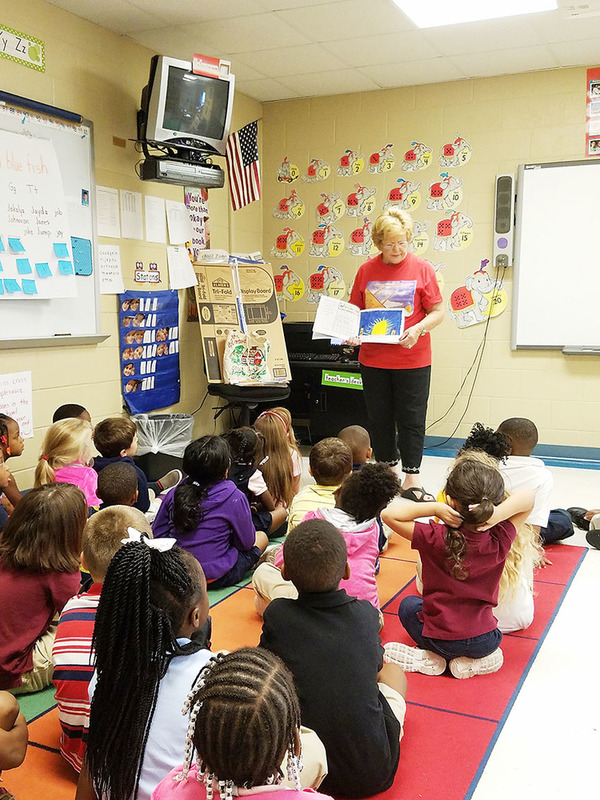 Darlene Robertson, retired teacher from Masterson Elementary School in Kennett, talks with Blytheville Primary School students about the terrorist attacks of Sept. 11, 2001, which prompted her and her students to write the book “Sept. 12: We Knew Everything Would Be Alright”. Robertson discussed with the children that even though outward situations might have been turbulent, inside she knew that life would still go on and the children would still have reason to smile. In the immediate aftermath of the Sept. 11, 2001 terrorist attacks, elementary children might have been anxious and very worried about what might happen to them and their family members. Darlene Robertson, a teacher in Kennett, Mo., told her students then that despite what might be happening in other parts of the world, the outlook for them was still very good. She said the same thing to students at Blytheville Primary School on Sept. 21. Robertson, who retired after 25 and one-half years at Masterson Elementary School in Kennett, visited with BPS students about the book she wrote with her first-graders, “Sept.12 - We Knew Everything Would Be Alright”. Robertson is very good friends with BPS kindergarten teacher Holly Jo Engle. The book by Robertson and her students earned them recognition as special America Remembers commemorative winners at the Scholastic Book Fairs' 16th annual “Kids Are Authors” program. The National Association of Securities Dealers Automated Quotations paid for them to come to New York City and open NASDAQ on Sept. 11, 2002. The book was given to the city’s public library, and later the students read it to Missouri Gov. Bob Holden in Jefferson City. Engle stated that the BPS students really liked the book, that it had illustrations that students their ages had created when they were young.